Does more equal better? When it concerns students’ essay scores on the Scholastic Aptitude Test (SATs), that may well be the case. 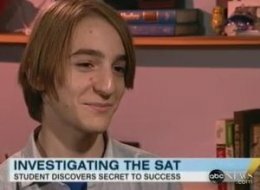 Milo Beckman, a fourteen-year-old student at Stuyvesant High School in New York conducted a study among his peers after becoming frustrated with the scores he received on the exam. Beckman took the exam twice, and to his surprise, discovered that his second test scored higher than the first, although he deemed the first attempt to be superior in quality. The second essay he wrote was considerably longer, but not, in the students’ opinion, as well written. In other testing news, it is not just students who are being graded. Increasingly, teachers are being held accountable for the performance of their students. Houston, Texas is the latest city to announce that teachers’ jobs will no longer rely solely on evaluations by their principals. Until this year, 99% of teachers received satisfactory performance scores based on personal reviews. However, now student test scores will play a much greater role in deciding who is hired and fired.